Early on, when Gary Russell Sr.’s sons prepared to fight, they were almost anywhere but in a boxing ring. They have sparred on street corners, in parking lots, in backyards and in alleys against strangers in the roughest neighborhoods in pre-gentrification Washington, D.C. Other times, there were bouts in the mailroom off the lobby of their apartment building. All the sessions were sanctioned, overseen and refereed by their dad. Later, when the family moved to suburban Maryland, their father converted the basement club room into a gym. There was wood paneling but no ring. Russell just hung a heavy bag from the beams, supplied gloves and headgear, and invited the neighborhood kids to battle with his boys and learn the secrets of boxing. No doubt, it was an unorthodox way to raise a family. But what would you expect from a father who named seven of his sons Gary? Also, who could argue with the results? One son is the WBC featherweight champion. Two were Olympians. Four became Golden Gloves champions. On Saturday night, three of them will be on the same professional fight card at the MGM National Harbor in Maryland, just a short drive from where the fighting Russells honed their skills. 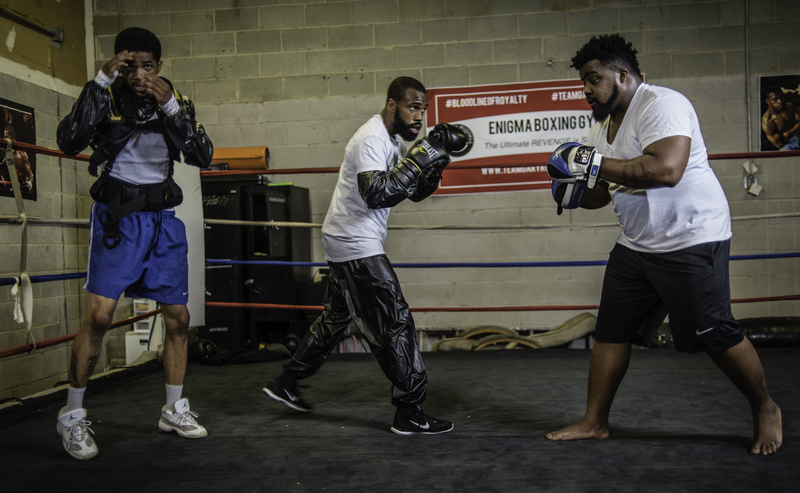 From left: Gary Antonio Russell, Gary Russell, Jr. and Gary Allan Russell work out in the ring. In the main event, 28-year-old Gary Russell Jr. (27-1), a member of the 2008 Olympic team, is heavily favored to retain his 126-pound WBC belt against Colombian challenger Oscar Escandon (25-2). Meanwhile, Gary Antonio Russell, 24, a bantamweight, will be putting his 7-0 record on the line. And younger brother Gary Antuanne Russell, 20, who lost a controversial decision just before the medal round in the 2016 Olympics, will be making his professional debut as a light welterweight. All three brothers will have their father and another brother, Gary Allan, working their corners. Saturday’s fight card will mark an exciting moment for the Russells, another milestone in the patriarch’s long quest to raise boxing champions and to use a brutal sport to help mold boys into men. Boxing families have existed through the generations, as the love of the sport and the courage to step into the ring are often inherited. Floyd Mayweather Jr., widely hailed as the best boxer fighting today, was trained by his father, Floyd Sr., an accomplished boxer, and his uncle, Roger, a former world champion. Former heavyweight champion Joe Frazier had two sons follow in his footsteps: Marvis and Joe Frazier Jr. Muhammad Ali’s younger brother, Rahman, fought as a heavyweight, and his daughter, Laila, earned fame as a women’s middleweight champion. Rahman Ali’s son, Ibn, is a former USBC cruiserweight champion. Gary Russell Sr. said he got interested in boxing as a youngster growing up in Washington, D.C. He would always find himself glued to the boxing matches on ABC’s Wide World of Sports, which he often watched with his Uncle Bobby, himself a fighter. Uncle Bobby taught him the basics: how to snap a jab, how to move his feet, how to hit a speed bag. Russell loved it. He would go to the garage to train nearly every day, and eventually he became an amateur boxer. Russell Sr. moved back to Washington and was about to embark on a pro career. But it ended before it could get started when he accidentally caused a rifle to discharge during a hunting trip and was shot in the knee. The injury left Russell Sr. with a pronounced limp, but it did nothing to diminish his love of boxing, and he vowed to teach the game to young people, including his sons. He had nine sons and two daughters in all, including six after marrying his wife, Lawan, 31 years ago. He has a strained relationship with his first son, Gary “Fast Hands” Jones, who fought professionally and is now retired. Another son, a promising boxer named Devaun Drayton, was murdered as a 17-year-old in 2004. Gary Antuanne Russell works out in preparation for his pro debut. When Gary Jr. was a toddler, he would follow his father around to gyms, trying on gloves and mimicking the boxers. After a while, his father would get on his knees so his son could jab his boxing mitts. As they got older, there were car trips around town to find sparring partners and training sessions in the basement with the other boys and neighborhood kids. Russell Sr. never let anyone else coach his sons — at least not for long. 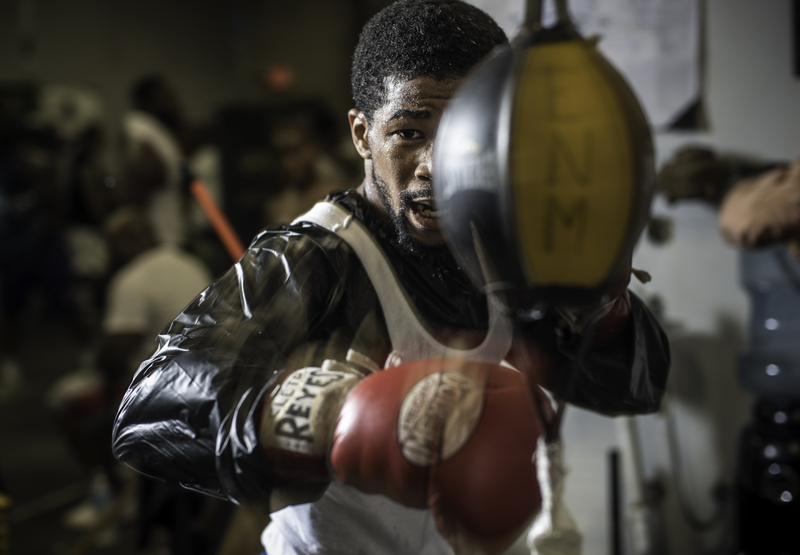 These days, the Russells work out at their father’s Enigma Boxing Gym, located in an industrial park a few miles from the family homestead in Capitol Heights, Maryland. At first, the atmosphere at Enigma feels like that of many other boxing gyms: The heat is cranked up, the rhythmic pops and thumps of punches hitting bags and gloves are constant, and the glistening bodies of the fighters are compact and cut. Gary “Another” Antonio Russell trains for his fight. The Russells say they see boxing as a means to an end and their father is careful with their careers. When Gary Jr. steps into the ring to defend his title Saturday, it will be his first fight in more than a year. His father has been criticized for not pursuing a more ambitious schedule. But he swats away that flak, saying he has the best interests of his sons in mind. That much will be evident as they share the stage Saturday night for the first time since they were fighting their way up through the amateur ranks years ago.